Charming Baker is a London based artist who studied at central St Martins. 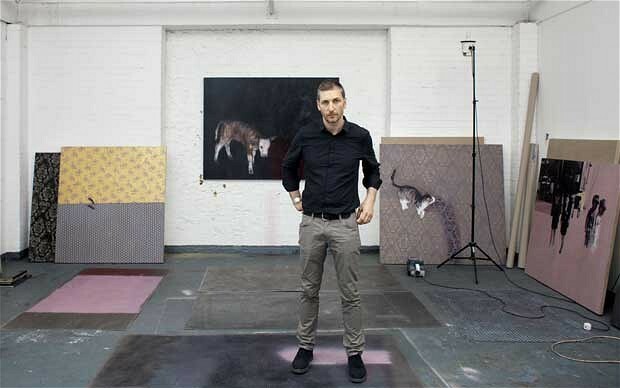 He has had an exceptional art career which has taken the British art world on by storm. Charming Baker has had several prestigious, sell out solo exhibitions in the UK and internationally. Hailed as one of Britain’s most talked about artist, Charming Baker has been championed by Damien Hirst (‘It’s hard to say what makes a painting great,’ Hirst has said. ‘Who gives a damn? Charming Baker’s paintings are great’) and has sold to the world’s biggest collectors, including Frank Cohen and Alberto Mugrabi. Baker’s artwork explores well-trodden and intrinsically linked themes; life, love, death, terror, joy, despair… with an underlying reference to the classics and a dark humour. He is also known to purposefully damage his delicate artworks, including drilling, cutting and occasionally shooting them with a shotgun, intentionally and inadvertently putting to question the preciousness of art, and adding to the emotive charge of the artwork he produces.